As a mama to be you are constantly learning new things every day, and one thing that may have come to your attention are the dangers of using certain skin care ingredients while your little one develops. Of course, you shouldn’t use certain toxins ever, (your health matters too) but it becomes especially important during pregnancy when any toxins that come into contact with your skin may cross the placental barrier and put your baby at risk. The easiest way to avoid toxins is to ditch conventional products altogether and to start purchasing only organic, natural products filled with plant-based botanicals, rather than nasty synthetics that don’t really do much for your skin anyway. 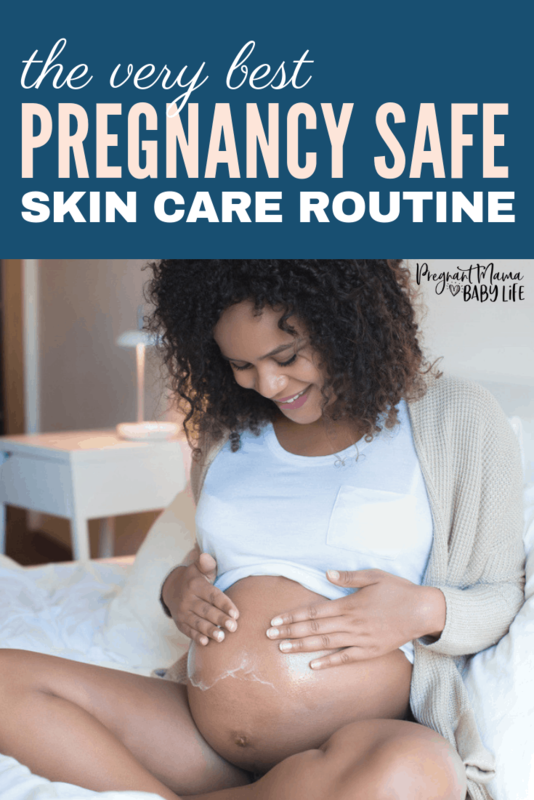 When it comes to skin care during pregnancy, you may be looking for products that will keep your skin hydrated, but not cause an overabundance of sebum, especially now that your hormones are running rampant and breakouts may have become the norm! We are going to share a simple routine with you, using all natural top-notch organic products, so you can feel like the beautiful mama we know you are! A good organic cleanser is the first step in any skin care routine and is important because it helps to remove grime and dirt that may have accumulated in your pores throughout the day. We especially love an oil-based cleanser, because oils help to provide a deep down cleanse, but won’t ever strip your skin of beneficial oils that you need for your skin to stay balanced. Ever used a foaming, conventional cleanser, only to be left with a feeling of “squeaky clean” skin? You can run your finger over your skin and feel no oil whatsoever and your skin feels tight and dry. This is due to harsh ingredients like sulfates that provide that creamy lathering experience many people love, but your skin on the other hand, not so much! After massaging an oil based cleanser into your skin, be sure to rinse with lukewarm water to further avoid stripping the skin and gently pat dry before moving on to the second step. Feeling a little emotional? Don’t worry, it’s the hormones and there’s nothing wrong with you, we promise! To help with the emotional side of pregnancy, try incorporating some scents into your routine that can provide nourishing skin benefits all while lifting you up and out of your funk. We adore the aromatic, sensual scent of Rose for an instant pick-me-up and this beautiful toner from Herbivore Botanicals will infuse your skin with a dose of antioxidants, while seriously boosting your spirits! Your skin may feel super hydrated after a few spritzes of an organic toner, but do not skip this last, and most important step of all! By skipping the moisturizer, you put your skin at risk of breaking out, because your skin may try to make up for the lack of oil by overproducing sebum. Not only that, moisturizers also help to provide a protective barrier on the skin to lock moisture in and keep pollutants out. Apply a generous layer and follow it up with a good SPF if you’ll be heading outdoors. Certain skin ingredients go above and beyond and can provide that extra oomph when your skin is in need of a little extra love. Many people love retinol, but this is one ingredient you should stay away from during pregnancy as it may increase the risk of birth defects. Instead, why not indulge and treat your skin to this beautiful hydrating, floral mask by Tata Harper infused with powerful actives that are highly effective yet gentle and safe to sue. So your face feels silky and hydrated, but what about your body? To help keep the skin elastic and prevent and fade the appearance of stretch marks, it’s important to slather on a body butter, as long as it’s all natural of course! Look for decadent butters like shea and cocoa butter, oils like silky coconut and sweet almond oil and an added dose of Vitamin E is always a good idea! Apply when your skin is still slightly damp from your shower or soak in the tub for optimal absorption. We wish you a beautiful pregnancy journey! By using all natural products you can be sure that you’re doing the best for yourself and your bub, and we bet you won’t go back to your old, conventional products again!